Why Mount Saint Vincent University? 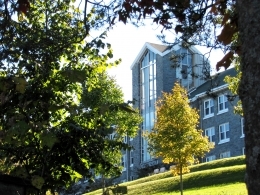 Mount Saint Vincent offers the best of both worlds - beautiful green campus where you can see deer grazing and you are only 10 minutes from downtown Halifax, Atlantic Canada's largest city. Founded in 1873, the University is home to 4,000 students from over 60 different countries. 88% of Mount students would recommend the Mount to family and friends, with 95% of the students feeling safe and secure and 94% satisfied with class size. Mount Saint Vincent offers highly interactive classes and small groups with a lot of support from the International Education Centre. Our services go far and beyond. The University offers unique programmes like Public Relations, Science Communication, Tourism and Hospitality, Business, Applied Human Nutrition and Child and Youth Studies. All undergraduate programmes offer experiential learning options like co-op or internships which provide valuable contact with the industry. Student will get involved. There are many activities, student societies and clubs as well as over 300 on-campus jobs for you to choose from. Undergraduate tuition & fees (10 courses): CAD $16,586- $16,969. International applicants for undergraduate: Mid June Graduate: varies by program please check here. Most undergraduate, certificate and diploma progammes start in September, January and May. Master programs start in September with the exception of Education (general curriculum studies and lifelong learning) which also start in January.